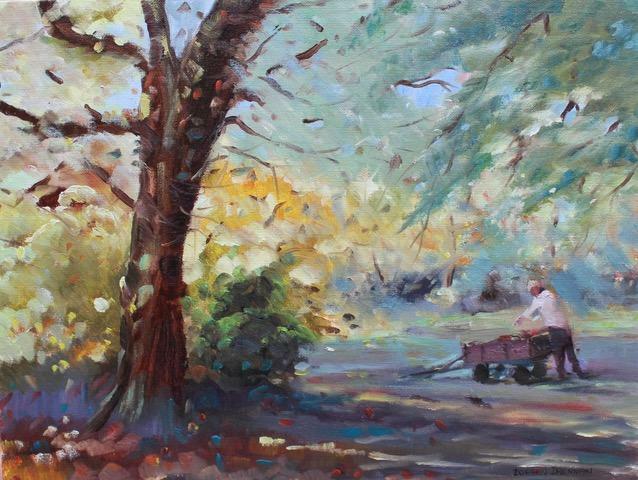 The beautiful colours of Autumn have arrived and this is a painting of a friend gathering leaves in his garden.The painting was created outdoors on a warm afternoon in the Burren . No rocky landscape this time as the Burren landscape is quite diverse and we have our rich green areas and old trees around Ballyvaughan. One of the things I enjoy immensely is visiting other peoples gardens and seeing how they are progressing, also of coarse one can learn so much from visiting. This year I am planning on extending the existing pergola in the Walled garden and building a stone wall around an area in the River garden by the old stone arch.The finished painting Autumn Gathering is available to view on my website.